If you wear dentures, you will be pleased to know that there are many different kinds of false teeth glue and adhesive options available. The purpose of these false teeth adhesive kits is to help hold dentures in place. When dentures are held securely in your mouth, they improve the way you eat, talk and project facial expressions. Loose dentures risk moving or falling out of place in these conditions, which may have an effect on your overall self-confidence. Creams – The most common of the four types is cream and because of the way it is applied and that it is typically in a tube, this adhesive is usually referred to as false teeth glue. Wafers – Wafers are the shape of small sheets and are designed to cover the complete surface of the dental fitting. 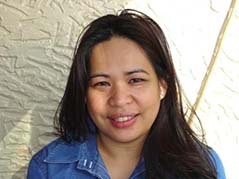 They are also designed in two different styles – uppers and lowers. Strips – Strips are a smaller version of wafers and work in the same way. Powder – Powder adhesives become a paste-like substance that is then used to hold dentures in place. The powder becomes a paste when it mixes with saliva in the mouth. 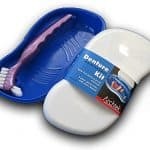 False teeth repair kits are a completely different product although they are often grouped together with adhesives and glues. 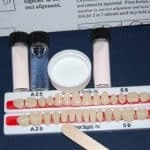 These kits are intended to be a temporary solution to cracked or broken plates or teeth allowing you to continue to use them until you can see a professional for a proper repair. 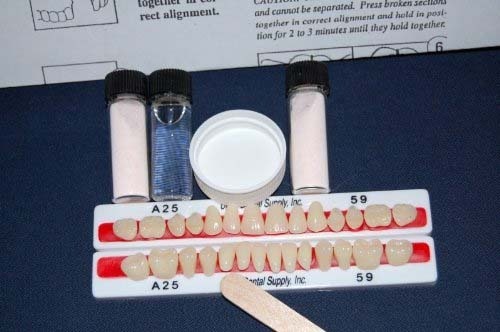 The kits come with liquid and powder mixtures that are used to fill in cracks, bond pieces together and replace teeth. For more information and a dedicated article on false teeth repair kits, click here. Although there are various kinds of denture adhesives, and many different manufacturers who produce complete lines of each, the best adhesive for false teeth is still very much a personal choice. If you have success using denture creams, then you will want to continue to use what works best for your situation. With this in mind, it is imperative to follow the directions that come with the denture adhesive product. As we’ve stated in other posts, following instructions is important when using any kind of glue or adhesive. If the manufacturer says to use sparingly, then do just that. With creams, in particular, it is wise to evenly space three small dots across the surface of the dental work that will rest against your gum line. 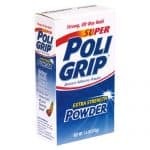 Using more than this may cause the denture to slide causing irritation. You should also apply the adhesive only once a day and do not sleep wearing your dentures. Cleaning should involve a rinse with warm water and a gentle cloth used to wipe away any excess adhesive before going to bed. There are three things to watch for when using any kind of glue for false teeth. Some products contain a high amount of zinc and if you use too much (remember to follow the directions) you risk a zinc overdose. 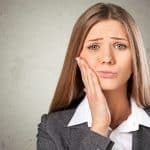 Another reason why you should not apply more adhesive than you require is that it can cause dental work to move around in your mouth developing irritations. Also, if you do not keep your dentures properly cleaned, they can encourage the development of bacteria and result in a fungal infection. If you are suffering from loose dentures, then this product is for you. 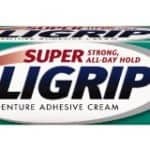 All-day denture grip is the promise that comes with this false teeth adhesive produced by one of the leaders in the industry. The manufacturer states that their denture cream will not allow food to get stuck underneath dental work and is made with a zinc-free formula. 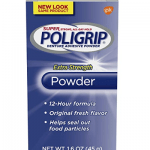 For more information on Super Poligrip Denture Adhesive Cream, click here. Slipping and sliding is not possible with the strong bond created between gum and denture with this adhesive for false teeth. The adhesive will not dissolve in water which means it won’t be washed away during meals. This product uses a flavor-free formula. For more information on Secure Denture Bonding Cream, click here. This easy to use false teeth adhesive cream has a simple application that holds dentures in place resulting in less slipping. It is also safe for use with dentures, gums and natural teeth. For more information on Fixodent Denture Adhesive Cream, click here. These denture cushions are described as soft, pliable and made for a comfortable fit. They are custom fitted for uppers or lower dentures and are designed to hold your dentures securely. These are intended to be used as a temporary measure before seeing a dentist for proper reconstruction, but if you are suffering from loose dentures, they may be a good option to get you out of trouble fast. 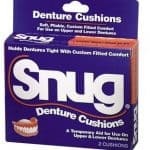 For more information on Snug Denture Cushions, click here. 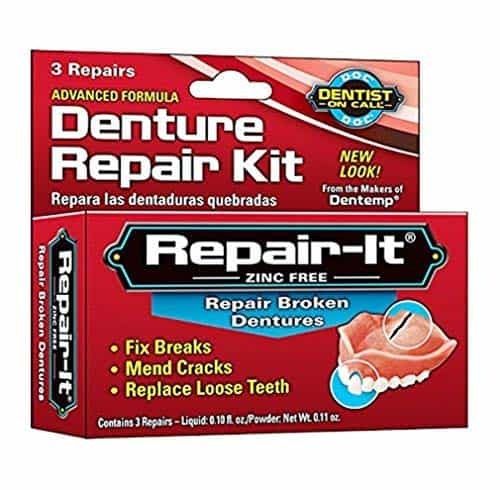 The Repair-It Broken Denture Repair Kit product is a mixture of powder and liquid that you combine into a paste, that you can then use to mend and fix breaks, cracks and loose teeth. It is intended to be used as an emergency repair kit and includes enough product for three repairs. It uses a zinc-free formula and is safe and easy to use. This is one amazing false teeth repair kit as it includes a total of 28 professional denture teeth. The adhesive paste material in this kit contains enough for up to seven broken teeth repairs and is designed to provide a temporary fix for broken or missing teeth until you can see a dentist. Suffering from loose dentures should no longer be an issue with the wide cross-section of adhesives for false teeth available to hold them securely in place. 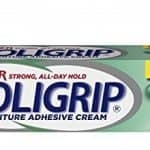 With a firm denture grip, using the best false teeth glue and adhesives allows you to talk, laugh, eat and drink with confidence knowing there will not be slippage or excess movement hampering your actions. 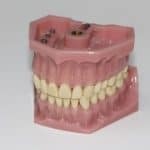 Also, should you break or crack a denture or false tooth, there are denture repair kit products available to provide temporary repairs in these circumstances. 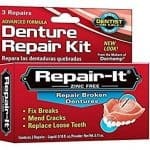 If you are a denture wearer, stock up on some of the best glue for false teeth options as well as a false teeth repair kit to keep you out of trouble.